It seems that the UK got lucky this year with the weather (although we don’t want to jinx it!) We hope that the sunshine carries on throughout July and August so that we can get outdoors and explore all that the county has to offer. 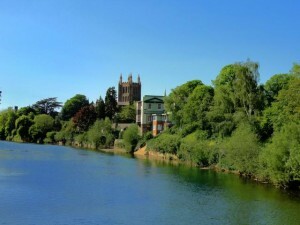 So that’s what this blog post is dedicated to – things to do in Herefordshire this summer! We’re showcasing some of the best events that the county has to offer, so that our guests at Caroline Bulmer Properties have the best possible stay! Each year, this event provides 12 days of thrilling musical entertainment to it’s visitors! Featuring the very best artists from across the UK and beyond, the Cheltenham Music Festival is perfect for any lover of classical music. Now recognised as an annual ‘must-do’ event for the county, the giant big top-style marquee will be returning once again to the banks of the River Wye – pitched right in the heart of historic Hereford. Food, drink, music & entertainment, what more could you want when holidaying in the beautiful county of Herefordshire!? The clue is in the title! If you’re a fan of Jazz and Blues this one’s for you, party the night away at the beautiful Castle House in Herefordshire. Held at The Courtyard in Hereford, this one is tried and tested! Go along with a group of your friends and enjoy the fast witted comedians and lively atmosphere – the evening promises to be a hoot and is bound to create amazing memories for your holiday! If you’d like to release stress, detox, improve your yoga or to simply just relax on your break in the Countryside, then rejuvenate at this yoga retreat. No prior experience needed, so anybody can go along! From Hereford to Rio… the top 2 teams at this championship will be off to the 2016 Paralympics, so all to play for. Proudly hosted by The Royal National College for the Blind, 10 teams from across Europe will be competing in this highly entertaining, fast paced sport. Come on England! If you’re looking to stay local for a long weekend, or for a family holiday, we still have some great Last minute offers available at The Cider Barn and The Lodge.